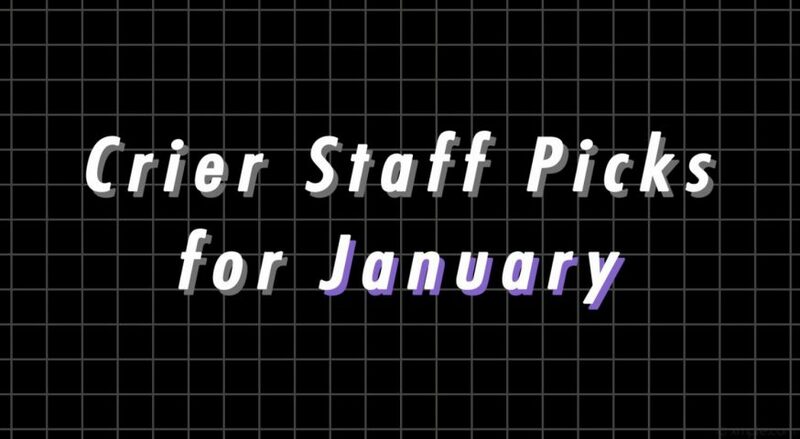 Throughout January, Crier editors have enjoyed many products and activities–here are some of the staffs’ favorites. We hope you enjoy them just as much as we did! Although the current season is very much not autumn, this book is perfect to sit with in bed on a freezing cold weekend and absorb. Smith beautifully melded poetry, art, books, and politics to create a heartwarming story about friendship between a young woman Elizabeth and her neighbor Daniel. The story shifts between flashbacks to each of their lives and the present and also between each of their points of view. The “present” is a post-Brexit world where Elizabeth is an art history teacher still being inspired by Daniel, who is over a hundred years old, and each of them reminisce upon the lessons they’ve learned from each other. Smith uses imagery to describe specific emotions in such a tender way that makes the reader understand exactly how Elizabeth and Daniel are feeling, and along the way, you end up learning lessons from them, too. “Greek God” by Conan Gray, the fourth track off his debut EP Sunset Season, is perhaps the mellowest diss track in existence. The first listen provides you with rich harmonies and seamless melodies, soothing the listeners. However, the lyrics provide a much different story: it is directed towards his high school bullies. He points out their insecurity that leads them to belittling others, telling them “what they really want” is “a little more confidence.” “Greek God” is substantial and sonically pleasing but also provides listeners with an anthem of self confidence. Although “Prisoners” isn’t a recently released movie, it’s a great thriller to revisit or even watch for the first time. Starring Jake Gyllenhaal and Hugh Jackman, the story revolves around a 6-year-old daughter and her friend who have gone missing. While a private investigator attempts to find the kidnapper, the father seems to take matters into his own hands. This movie has always been one of my favorite crime mysteries because through the phenomenal acting, it captures how far a parent may go in order to find their child. Not only that, the well-written plot always keeps you at the edge of your seat up until the very last scene. If you’re into suspenseful crime/thriller movies, this may be the perfect movie for you! Play Music & Record Songs has an app called The Piano on the App Store. It’s not just for people who play the piano, but also for anyone who needs to tune an instrument or sing in the right key. The app provides a digital piano and you can play any note in any octave. I highly recommend the app to singers; it is especially helpful when you’re in doubt about whether you’re hitting the right note or not. You could also just use the app to have fun and hit random notes. Winter in the Chicago area is usually very cold, and this winter is no exception. With record breaking temperatures recently hitting the area, most people are choosing to stay inside where it’s warm. The perfect drink to accompany this chilly weather is a mug of steaming hot chocolate. It’s a classic winter drink, and there are many different ways to customize it. I personally prefer to serve it with a generous topping of whipped cream, but marshmallows are a good alternative. If you are a more mint chocolate person, this is the perfect opportunity to pull out those leftover candy canes from Christmas. No matter how you like to customize it, hot chocolate is a great drink for this month. With all the hype around coconut oil, how good can it actually be? For eating purposes I would not recommend it. After adding it to my mashed potatoes one Thanksgiving, I’m traumatized by the taste. But as a makeup remover it works miracles! It takes off any type of makeup, even waterproof makeup. I’ve been using it as a remover for two years now, and coconut oil doesn’t irritate my sensitive skin but leaves it both moisturized and clean. I frankly don’t miss the burning sensation and breakouts from traditional makeup remover wipes. Personally, coconut oil has helped stimulate hair growth, so it is a plus for lashes and brows! I also use it weekly as an overnight deep moisturizer for my dry skin; it helps my dry patches and gives my skin a glow the next day. Other than skin purposes, I use coconut oil as a hair mask (just ends) and oil pulling (helps remove bacteria and whitens teeth over time). TJ-Maxx is one of the best stores to find anything you may need: clothes, house wear, makeup, skin care, shoes, and even food. An extra plus is how inexpensive everything is! Whenever you go to TJ-Maxx, you can be sure you’ll be walking out with at least one great find. There’s always an amazing deal. Although Dan Thai has admittedly always been at the top of my “Best eateries near me” list, I gained a newfound respect for the delicious Thai restaurant last week, when I had a hankering for Thai food and desperately wanted to escape the polar vortex. The steamy jasmine tea I ordered—along with the finger-licking veggie rolls, ginger garlic tofu, and panang curry that I gobbled up—made me forget all about the frosty weather! I heartily recommend Dan Thai as a place to eat and hang out with those you love. The best part is that even in this -14 °F weather, you can always order Dan Thai for delivery. Just remember to tip your delivery guy well; it’s brutal out there! Looking for an escape from the freezing Chicago weather? Well, Florida is the perfect place for new scenery. Despite being a basic vacation spot, it is still an amazing location and will not disappoint. Cities like Fort Lauderdale and Miami have a variety of beautiful beaches, the perfect place to get an early start on your summer tan. Let’s also not forget the fun and nostalgia of Disney World! No matter what age you are, you are bound to enjoy the magic of the theme park. With such a wide variety of activities and tourist spots, Florida should definitely be on your list. With the college football season ending earlier in the month, the NFL has had the entire football world’s attention to itself for most of the month. It has sure been exciting, especially during conference championship weekend, which provided two games for the ages. Though the officiating in both of these games were far from perfect, the interest in the NFL is at an all-time high for fans due to the emergence of electrifying offenses. Super Bowl LIII is on Sunday, and as much as I want Jared Goff and the Rams to win, I’m afraid that Bill Belichick and Tom Brady will win their sixth Super Bowl together. The emotionality of “This Is Us” is unmatched. The show has a unique storyline, paralleling the 1980’s childhood of three siblings to their lives as adults. The show brings viewers deep into the lives of siblings Kevin, Kate, and Randall, establishing empathy and relatability to their problems. Their parents, Jack and Rebecca Pearson, suffered the stillbirth of their third triplet at the time of Kate and Kevin’s birth. However, the same day, they decided to adopt a baby, Randall, who was brought to the hospital after being left at a fire station. The show highlights the strong morals of the couple as they raise three children and balance their personal problems with those of their kids. The audience can develop a genuine connection with the characters as they navigate the the ups and downs of their lives and experience the effects of their upbringing in adulthood. “This Is Us” has a light hearted tone while still discussing serious issues such as substance abuse and eating disorders. The dramedy is the perfect blend of the feel-good energy of family shows and the heartbreak that often comes with dramas. Heart-warming scenes might just be enough to keep viewers warm in the cool January weather. But the show is a bit of a tear-jerker, so I definitely recommend sitting down with some tissues.